Honolulu Mayor Kirk Caldwell signed two city ordinances Monday that will tax Waikiki commercial property owners and raise millions of dollars to combat beach erosion and shore up coastal infrastructure in the state's top tourist destination.Star-Advertiser. Honolulu Mayor Kirk Caldwell has signed two bills creating a special improvement district in Waikiki to require commercial property owners to subsidize the restoration of the eroded beach. Civil Beat. 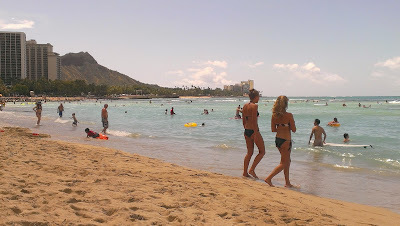 Waikiki Beach loses tons of sand each year and obtaining funding from the state legislature to replenish it takes at least a couple of years. Today, two City and County ordinances were signed into law to enable surrounding businesses to contribute to maintaining the beach. Hawaii Public Radio. This year, state lawmakers introduced a record number of bills aiming to modernize and restore trust in Hawaii’s county police departments, yet only one of the police reform bills passed. Civil Beat. Children in foster care in Hawaii are far likelier than those in other states to live with a family, rather than in a group setting, and to be placed with relatives, new data show. Star-Advertiser. The Hawaii Elections Commission voted Monday to keep Scott Nago as Chief Election Officer for another four years, according to the commission's head William Marston. KITV4. Inmate escapes have nearly tripled in Hawaii over the past few years and every time it happens, officials say there will be consequences. KHON2. Living Hawaii: Our Retirement Boom May Cost Us Dearly. People live longest in the country's most expensive state. They're putting off retirement or planning to work until they drop. It all comes at a price. Civil Beat. The state Department of Land and Natural Resources reminds the public that the moi fishing season is closed June 1 through Aug. 31. Star-Advertiser. A military plane crash that killed a Marine and injured several other service members during a training exercise in Hawaii has renewed safety concerns about the Marine Corps' new airplane-and-helicopter hybrid. Associated Press. Toraki Matsumoto served his beloved Central Oahu community with distinction during his 17 years on the Honolulu City Council. Matsumoto, 86, died May 2 at Kuakini Medical Center. Star-Advertiser. The County Council is poised to strike the word “Roundup” from its budget, but it remains to be seen if substituting “vegetation management” on paper will make a big change on the ground. Just one dollar out of every $14,627 in the county budget is spent on roadside spraying for weed control. That, however, didn’t stop opponents from devoting the greater part of Monday to asking it be struck from the $438.8 million budget. West Hawaii Today. Despite an increase of $200 for a fine for driving while on a cellphone, Big Island motorists are still using their electronic devices while navigating local roadways. According to the Hawaii Police Department, there have been 824 citations issued so far this year for use of a mobile electronic device while operating a vehicle. West Hawaii Today. Nelson Doi, who served as lieutenant governor from 1974 to 1978 with Gov. George Ariyoshi, died Saturday at his home in Waimea, Hawaii island. Star-Advertiser. It remains to be seen when a section of the Haleakala Trail that used to take people to the summit will be open to unguided hikes even if a tentative settlement giving the state ownership of the trail is confirmed next month, a state official said Monday. Maui News. Opinion: After something like a decade of earnest testimony and moneyless lobbying, it looks like the Maui Dance Advocates may finally–FINALLY!–win their fight to force the Maui County Department of Liquor Control to do something they’ve steadfastly refused to do: define “dancing.” MauiTime. The second annual Startup Weekend Maui proved that it is possible to create a startup - and a pretty good one - in just 54 hours. Maui News. The Kauai County Council will meet at 1:30 p.m. today to listen to comments from the public regarding possible zoning ordinance changes that deal with permits for bed-and-breakfast operations. Garden Island. Demolition of Kauai’s long-shuttered Coco Palms Resort is scheduled to begin in the next 30 or 60 days, clearing the way for the redevelopment of the iconic property into a Hyatt-branded hotel. Pacific Business News. Newer and more reliable transportation is coming to transit riders in Kauai County. The county purchased 20 new buses that will be used to replace older ones in the Kauai Bus fleet. The total number of buses will remain unchanged at 56. Associated Press. Kauai County has purchased 20 new buses that will be used to replace older vehicles in the aging Kauai Bus fleet. The total number of buses in the fleet will remain unchanged at 56. Garden Island. Legislators from Kauai will recap the recently completed session at the May 28 meeting of the Lihue Business Association. Garden Island.